Yesterday I showed you the new look to the living room- at least the first part of it. Finding large pieces of wall art can be very expensive, and since this makeover was kind of done on a whim, I had to to do something pretty budget friendly. These were relatively simple to make, so you can crank these out pretty quickly. I measured out on the wall what I thought would be the 'right' size for the pictures. The foam core boards came in a 20x30 size, and I didn't need them quite that big, so I cut off 6" from the length. I scored it with my exacto knife, and then cut all the way through. I layed out the board on top of the burlap, and then cut about a 2' border of the fabric all the way around so it would wrap around to the back side. I also cut the corners at a 45 angle so the bottom corners weren't all bunchy from a squared edge. It gave the art a nice, clean, square edge. 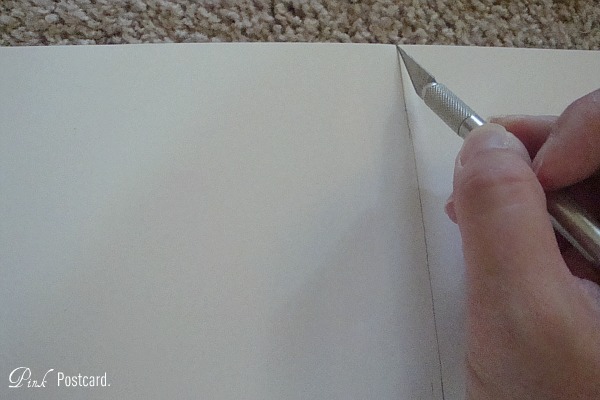 You can trim off any excess from the corners as you start to wrap and staple. 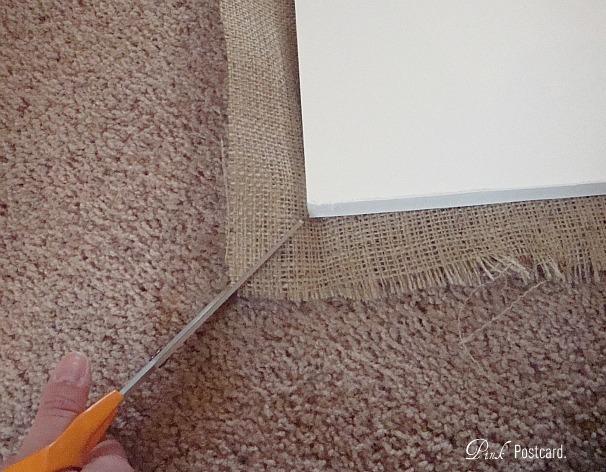 Make sure as you staple around the edges that you are pulling the burlap so it is nice and tight against the board. Next is applying the calendar or art to the board. I trimmed off the raggedy edge from tearing it out of the calendar spiral, and then trimmed off the calendar print that was at the bottom. Using a spray adhesive I quickly sprayed the back of the paper and then layed it, centered, on the burlap board. Make sure you hold the can far enough away from the paper so that you don't have a giant wet spot seeping through to the right side. 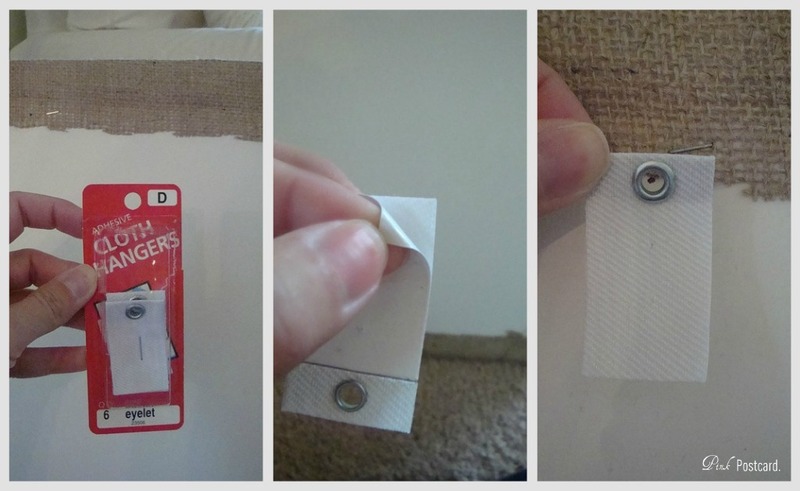 You want to work quickly while still getting the adhesive all over the backside. Smooth it out with your hands once it is down. I added some nail head trim to the corners of the paper once it was in place. It was very easy just to push them through since it was foam core. I used "antique oxford" and one box was all I needed for the 5 prints. It was $1.39 at True Value. Next, I added the hangers to the back of the prints. While I was buying the nail head trim, I spotted these fabric eyelet hangers and knew they would be perfect for this- lightweight, peel and stick, and a nice little loop to hang it. The final element to the art was adding a botanical tag on the bottom. At least that's what I'm calling it. Each of the flowers that I used from the calendar had a number in teeny tiny script on the paper. I thought it would look great to add that in larger form to the bottom of the prints. 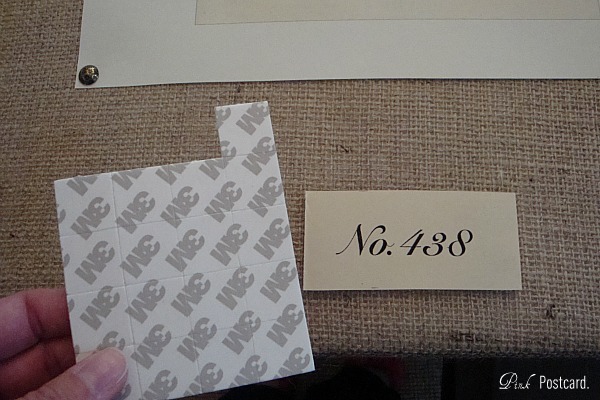 I had some vintage sheet music that had a couple blank pages in the back, so I used those to print off the numbers. I just ran the paper through my printer, cut them out, and then applied them to the board with the double sided 3M foam tape- for a raised look. That was it! In all, it took me about an hour to put these all together. I love how they look. It fills up a large wall space, and I didn't have to spend a ton of money. spray adhesive = "free". ha. Not really, but I already had it for other projects. If you were to purchase it, I think it's around $5 for the can. Nail head trim and cloth hangers = $1.39 each. vintage sheet music & 3M double sided foam tape = again, free for this project. I have stacks of music for other things, so I just used from that. You can pick up vintage sheet music pages for typically under $2. The tape is something I also had in my craft stash. Usually around $3 in any hardware store. If you add in the mirror that is also on the wall, it would be $64. I hope this project inspires you to do big things on a little budget! now that looks great. way to fill up the space and bring the eye up. i love it. Now the look of your living room is great. 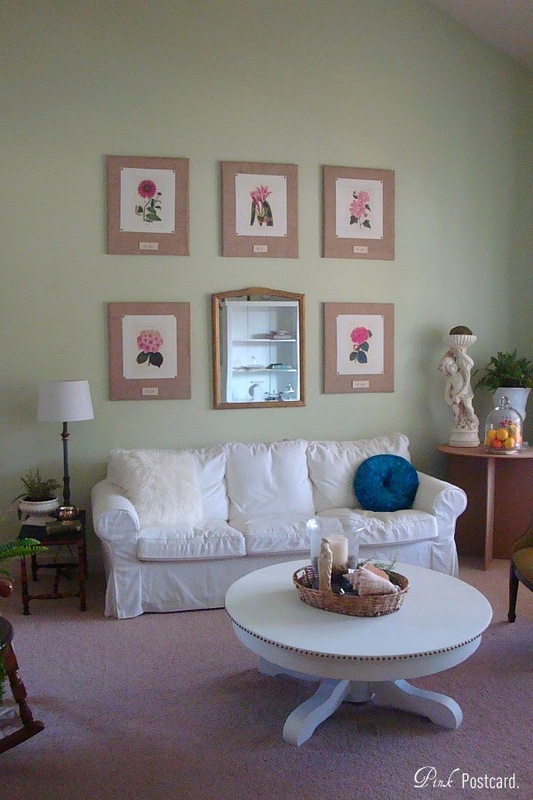 I have been following you for the last couple of posts on remake of your living room. You finally fixed it up in a lovely way. Love the wall art. Wonderful tutorial, Denise...and a beautiful final result! Fabulous! Using the foam tape for the numbers was brilliant!! You asked about the paper I used on my sweet little linen cabinet, I got it at a thrift store and I think it was a vintage Laura Ashley....I love it! Fantastic idea and I love the grouping on that wall! Thanks for the tutorial....I have to do this somewhere. That's a great idea, Denise! I love how they turned out! I had no idea they had that 3m adhesive that you used for the numbers. I'll have to keep my eye out for that; I know I had projects in the past that it would have come in handy. These look so great! I love the burlap texture. These are beautiful! Thanks for stopping over at hatingmartha...I am happy to be a new follower of yours. Love pink! Looks beautiful!!! Now I have an idea for my burlap I purchased yesterday! I'm stopping by from Show & Share blog hop! Oh my! I love this idea. Your space is lovely. What a great idea. I love the finished product. They look amazing group together over the sofa. Well done my friend. 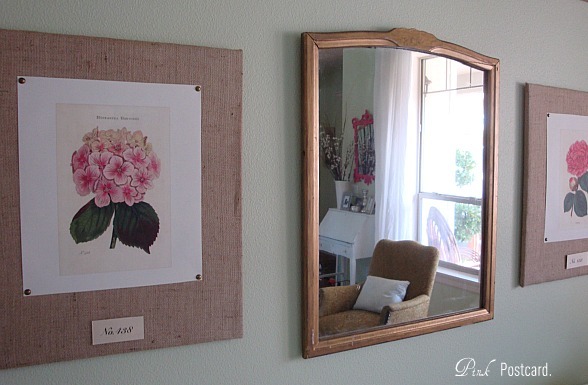 This looks so pretty on your wall--fits perfectly in your room! 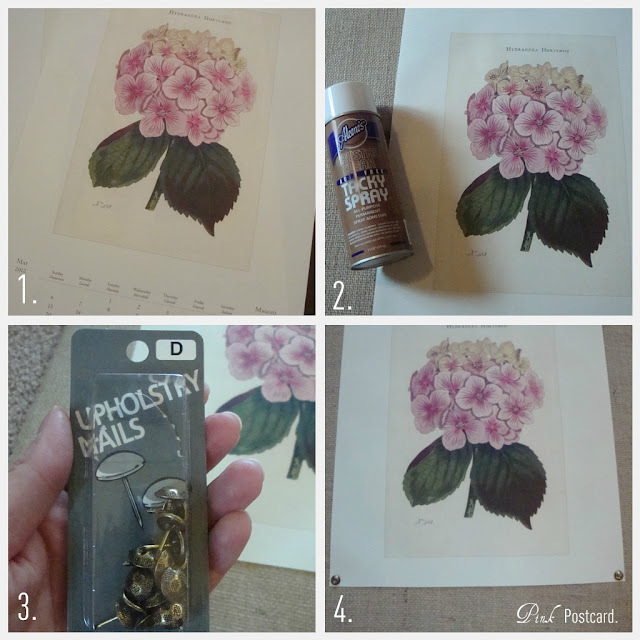 What a fun way to do inexpensive art! Thanks for sharing this @ Show & Share! I am so glad to have you here! Those turned out just beautiful! Beautiful! Thanks for linking up to the burlap party at WhisperWood Cottage!